Thinking Pinoy: Roxas has his own Internet Army? Lo and behold “MAR On-Line Warriors” (sic)! Rumors about the existence of a Liberal Party online army have been circulating these past several months. Because Thinking Pinoy does not subscribe to rumors, TP simply ignored them. That is, until TP read about a Rappler report, and then one thing led to another. Last month, Rappler released the story “Who gamed the Rappler election poll?”. Rappler said it “discovered evidence of systematic, organized gaming (cheating) in the [pre-electoral] survey that Rappler.com ran in December 2015.” Brackets and parentheses supplied by Thinking Pinoy. “Roxas was clearly the beneficiary of this manipulation, but the numbers and the sources of the vote surge do not allow us to identify who may have been behind the attempt to game the survey. This could be either his supporters or people out to discredit him,” according to the report. At this point, I was certain that somebody’s cheating the polls. But as to who it was, I have yet to know. 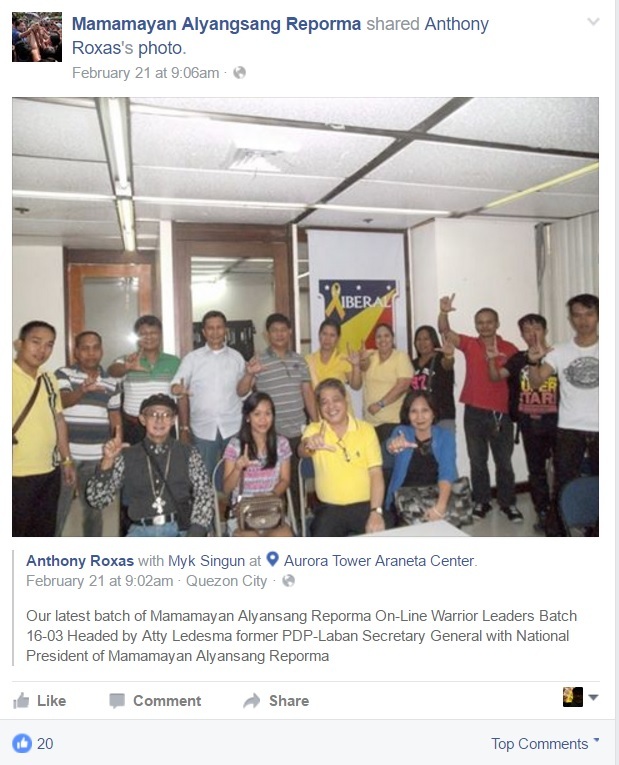 Then ThinkingPinoy stumbled upon a certain Facebook group named “Mamamayan Alyangsang Reporma (MAR)” (sic), which mentioned something about a certain group called “MAR On-line warriors” (sic). 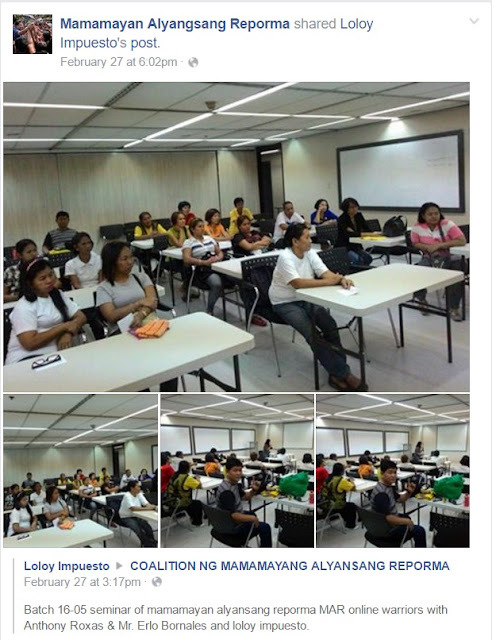 “Our group Mamamayan Alyansang Reporma saw a need to train our volunteers to handle social media issues against Mar from all the false information being radiated by various Presidential candidates, who are seemingly ganging up on our candidate. We are teaching our volunteers to post rebuttals on the false issues being sent out with complete facts and figures to substantiate our side of the issue,” according to a March 1 MAR post. Anthony Roxas claims to be the group's secretary-general, according to his own profile page. 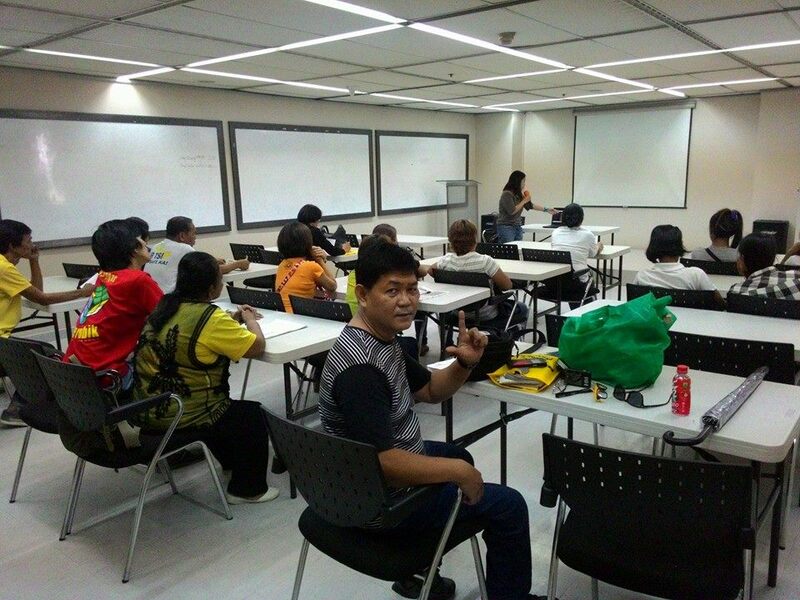 Impuesto posted Batch 16-05’s training session on 27 February 2016. 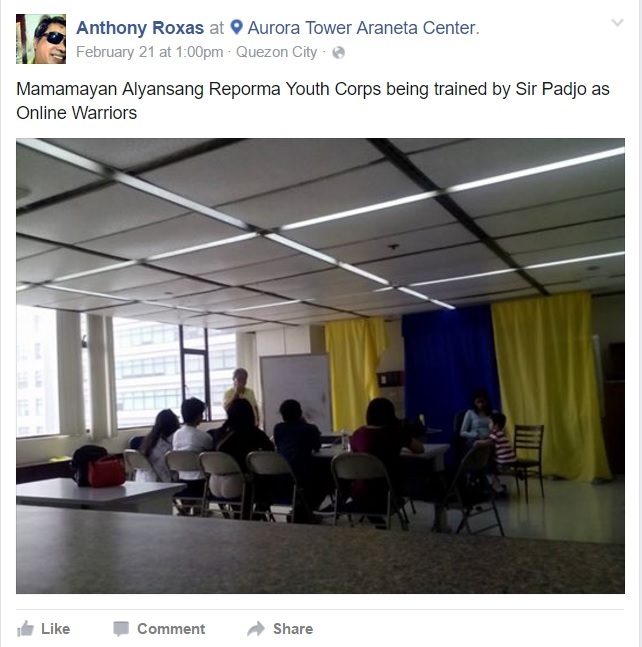 Meanwhile, another post by Anthony Roxas showed photos of Batch 16-03’s training session on 21 February 2016. Judging from the numbering system, it appears that the first two digits refer to the year while the next two digits refer to the class number. For example, Batch 16-05 would be the 5th training batch in 2016. Oh, and they even have an "Online Warrior Youth Corps". So how many batches did they train in 2015? Just how many people are there? That would be interesting to know. “Briefly the Mar OnLine Warriors are 100% Volunteers who are Pro-Mar and coming mainly from the C-D-E levels of the community,” according to MAR’s group page. Based on the photos above, the training sessions were held are in clean, well-lit, and modern offices, something that “C-D-E levels” will not be able to afford on their own. Thus, they should be receiving funding from somewhere else..
Impuesto in one of the MAR On-line Warriors training sessions. 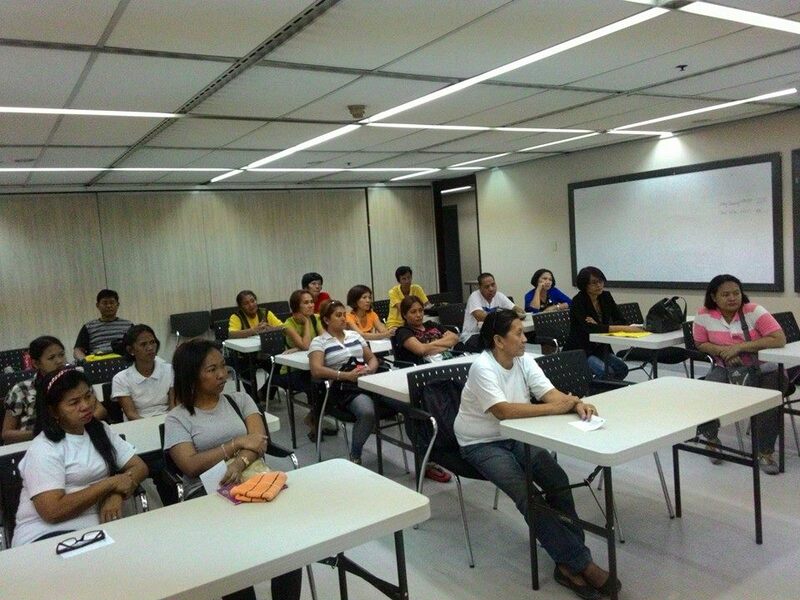 More interestingly, training sessions were held at the Aurora Tower in the Araneta Center, as shown in the geotags in the photos above. The Araneta Center is owned by the Aranetas, Mar Roxas' maternal clan. Seated is Judy Araneta-Roxas, Mar Roxas' mother and the Araneta Family's matriarch. 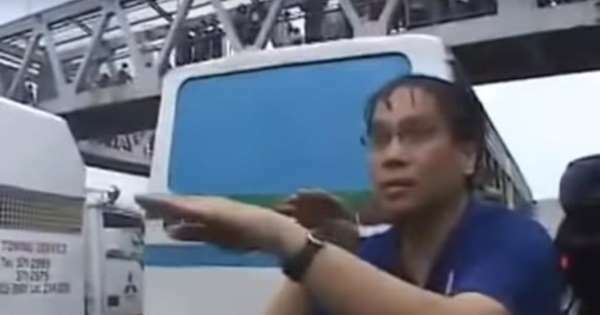 The person at the back, wearing yellow, is Anthony Roxas, MAR Secretary-General. 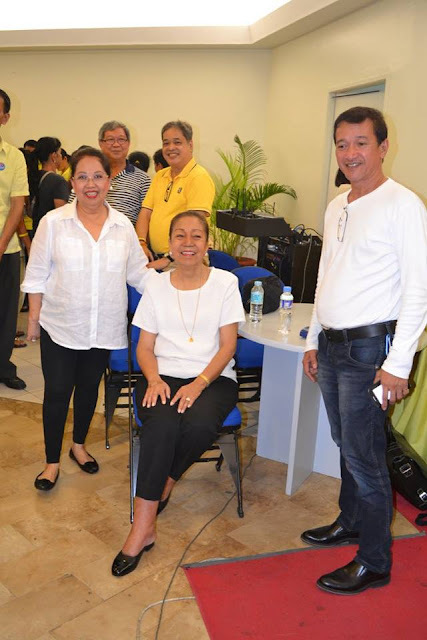 Judy Araneta-Roxas is a known LP campaign donor. She donated Php 25 million to the Liberal Party in the 2013 Elections, according to a PCIJ report. So here are self-proclaimed "C-D-E" citizens, training in a swanky Araneta-owned office building, rubbing elbows with the Araneta family matriarch who also happens be to a campaign contributor. What does that mean? Is this a good thing or a bad thing? That's for you to decide.